Looking for a Creative and Unique Valentine’s Day Gift? : What about a Personalized Book for that Special Someone? You are here: Home / Media Reviews / Looking for a Creative and Unique Valentine’s Day Gift? Looking for a Creative and Unique Valentine’s Day Gift? What about a Personalized Book for that Special Someone? I love to read and have to admit that Alice in Wonderland is still a favorite book of mine! 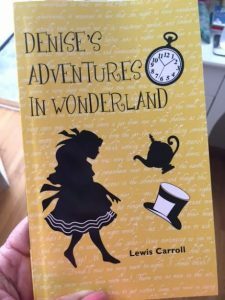 I was thrilled when I was contacted to review a Personalized book and one of the choices was Alice in Wonderland. I love how you can choose different characters or keep the same ones as the original story. You can even have a photo added on the back cover. Ustar Novels makes you the star of your own personalized story and there are many different options to choose from. You can find them here. They also have book choices for both kids and adults. This would make a great gift for Valentine’s Day! Self Disclosure: I received a free book to facilitate this post.